The incident which was caught on video and caused quite a disturbance along a residential street in Ocoee, which is near Orlando. An alligator roaming through a central Florida neighborhood head-butted a trapper, knocking him out cold in a last-ditch effort to escape. 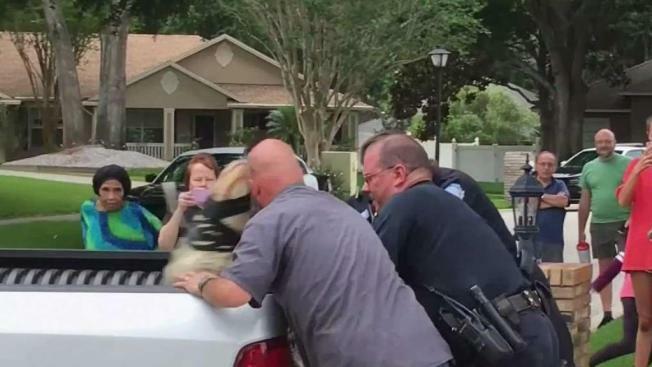 The incident, which was caught on video and released Tuesday by WKMG-TV, caused quite a disturbance along a residential street in Ocoee, which is near Orlando. Video shows a Florida Fish and Wildlife trapper putting the 8-foot gator in the back of a truck. The feisty, tied-up alligator lashed out and head-butted the trapper. The trapper fell to the ground as police and another trapper worked to get the gator back inside the truck. The video was first posted to YouTube on May 25. The trapper regained consciousness, but there was no word on his condition.